Discussion in 'Food Plots for Wildlife' started by Eshoremd, Aug 8, 2018. I currently have a 1/4 acre of alyce clover. Its surrounded by a fallow field last mowed last fall. Only equipment I have is an atv with pull behind sprayer, pull behind spreader, drag harrow and shoulder bag seeder. I have a 25lb bag of Hancock clover mix but was thinking about waiting till spring to plant that. I assume with my limited capabilities I am limited to a small seed species due to planting depth. I was thinking about expanding it to a 1/2 acre. Am I right to assume I can glyph the 1/2 acre, go back in a week or 2 and broadcast before a heavy rain and smash down the current vegetation with a weighted drag? 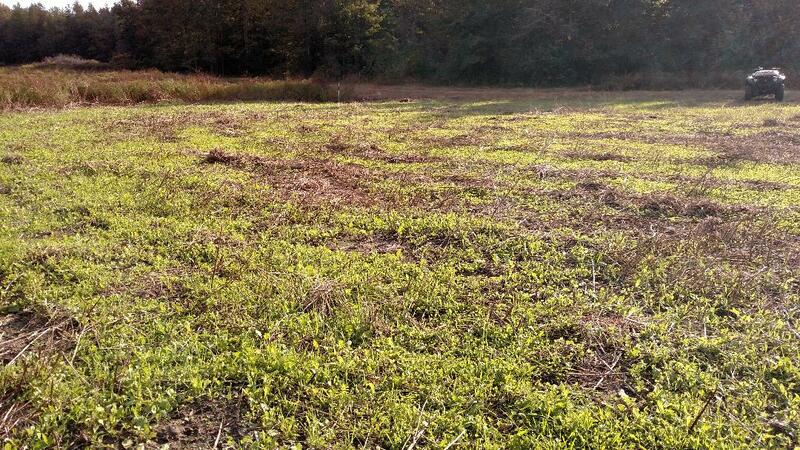 As a rookie, you should probably NOT plant clover in the spring, especially on the Eastern shore. Your odds of being successful are probably an order of magnitude greater when planted in the fall. I don't know the thickness of your existing cover and that makes it hard to make a recommendation. It sounds like throw and mow, but if your wanting something in the way of a food plot this fall (plant clover now for next fall). This is just me, but I would need to get all that other stuff out of the way before I seed, especially since I'm going to recommend you plant some oats, wheat, or rye with your clover. Can you mow? I'd mow it as flat as I could get it last week of August. Depending on the weather, throw your seed (your choice) on the ground the first or second week of September, but no earlier than Labor Day...unless there's a hurricane coming! 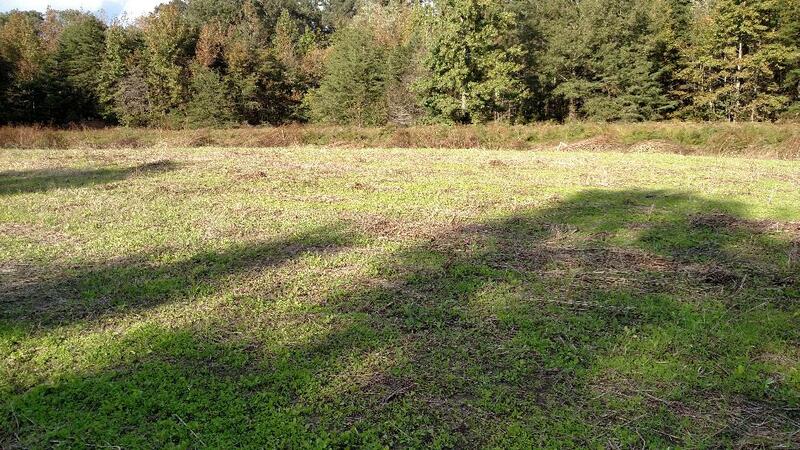 About 10-days after you plant the rye/wheat/oats you'll have the beginnings of a nice food plot. You won't see much of any clover until next year. It will germinate under the grains, but it'll be baby size, taking it's time for when the time is right. I'm not much into spraying this time of year unless you have perennial grasses that need removed. But, until you can identify the annuals and perennials its a crap shoot although it doesn't cost much to use gly. If you choose to spray, do it now, but wait to seed, not because of the herbicide, but because it's too early - too hot - too much potential dryness ahead. So I can mow then throw oats, cereal rye and clover mix? I was under the impression I need to get the larger oat and rye seeds deeper in the soil. From your post, I think you don't have that option. I'm suggesting you get the thatch on the ground and maybe out of the way so some of the seed can make it to the ground. If your thatch is thick enough and the Gods are with you. some of the larger seed might get caught in the thatch where it will be protected just as if it were in the soil. The clover is small enough and has a hard enough seed coat some of it will make it to the ground where it has all fall and winter to get beat into the soil. Back to the "big" seeds. Rye will grow anywhere. Oats want covered by soil. Compensate low germination rates by spreading more seed. There's a contingent here who will recommend seeding and then knocking the thatch over on top of the seed. I guess that works, too. I'm just old school and want my seed in or on the ground as fast as it can. Wait....is it throw and mow or mow and throw? I’m wanting to get it right in a few weeks. I have been in the same spot as you, before I bought a tractor and same better equipment. I would spray, come back in 10 to 14 days and spread my seed. Then mow. The mowing will knock the seed to the bottom and cover most of it with thatch. I usually mix some Iron Clay peas and a little Austrian Winter Peas along with the winter wheat and oats. I have a hard time most years getting WR around here. This has produced some very good plots in the past. 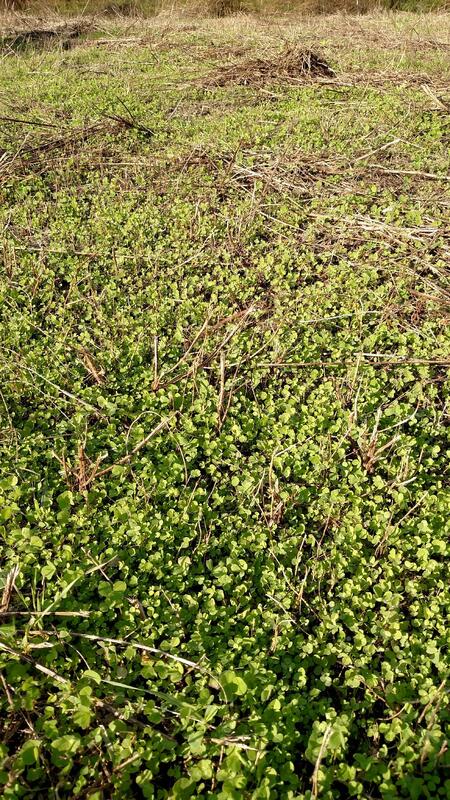 The clover will pop up in the spring and has done extremely well. Mennoniteman and Eshoremd like this. you have an ideal situation for the throw n mow. Go ahead and spray to kill everything. I would wait a few weeks and find your best rain chance and go out and throw out your clover and add some wheat or oats or cereal rye. Then mow it all down on top of the seed. You will get pretty good results just make sure to use a little more seed than what is recommended because not every seed will germinate but with limited equipment you can't ask for a better plot. I have done a ton like that. Plus not tilling the soil is better for your soil. And yes you can spray and then broadcast and then drag over the dead vegetation to smash it down and it will work. I have done that before when my atv broke down except I just drove my truck all over it to knock it down. Eshoremd and Creek chub like this. It was mowed last fall, but what exactly is growing there now and how tall/dense is it? I'm from the seed 1st camp, but if your dead, and thatch-to-be is too thick, it will become mulch and your seed sprouts may have trouble poking through it. I like to spray, seed, mow but it depends on the thickness of the thatch you'll put on the ground. Sometimes, seeding then adjusting the mow height a little higher (after sprayed stuff is dead) put some beneficial, moisture retaining thatch on the ground without smothering the seeds. I've mowed too low and looked back and wished I raised the deck a few more inches. Something else... some weeds remain upright after we kill them and our seed can make it to the soil when we broadcast it. And some weeds (mostly grasses...foxtail for instance) lay down in a mat as it dies preventing most of the seed from reaching the soil. 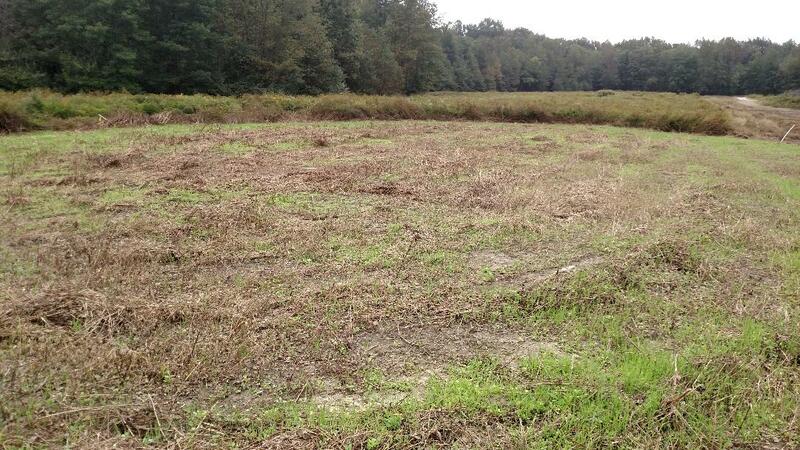 Course-stemmed stuff like goldenrod, is less smothering when laid down. It shads the soil to retain moisture, but still allows sprouts to grow through. I don't think there is one perfect answer that fits all situations. Look at your field and figure out the best way to get seed to soil contact while retaining soil moisture, without smothering the seeds. Native Hunter and shawn cox like this. well said. It all depends on his situation and how is it growing there. So I mowed high and broadcast my clover mix and then mowed again lower. I did this right before a good rain in late September. This was the outcome. Those pics were taken mid/late Oct. It actually grew in pretty good. I also added some rye, oats and brassicas. The deer hit it waaaaaaay harder than I anticipated. My question now is what to do for spring? Do I rake or mow all that thatch that is there and then frost seed with more Hancock clover mix to help the bare spots? I have the option now to mow so should I just mow to help with the weeds or should I spray Cleth and 2,4db or do both as things warm up this spring and summer? Thanks again for all the help guys!!! That fall plot did well for the first season. You don't want to do anything right now. Frost seed the clover in late February, then wait for warm weather to spray clethodim, like when the grass is about 3" tall. I wouldn't mow until mid May to early June. Mowing controls a different set of weeds, but not the grass, grass thrives on being mowed. Cleth kills grass, but only when it is short. After mowing in June wait several weeks, if more grass is coming hit it again with cleth. FarmerD, Jack Terpack and Eshoremd like this. 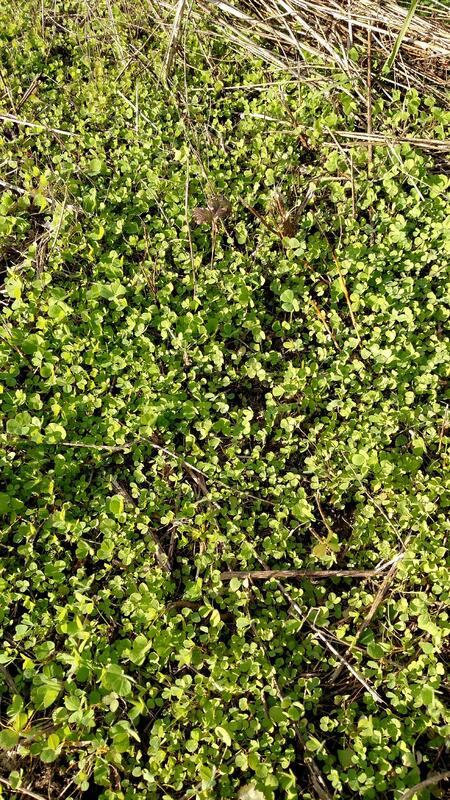 I think, also, if you used this mix https://hancockseed.com/products/hancocks-killer-clover-mix you'll have an explosion of clover in April. Won't hurt to frost seed some of the thin spots, like Mennoniteman said, but I think you might be pleasantly surprised (assuming ph is up there and lots of P&K). Spray for grass when things warm up and on this 1/4 acre, use a hoe to chop any broadleaf weeds out ..... won't take you too long and will give you a good aerobic workout! Mennoniteman, Eshoremd and wbpdeer like this.